Awwwwwwww-some. He almost blends in to the piece, very cool. That sucker must weigh a ton with all that ink. 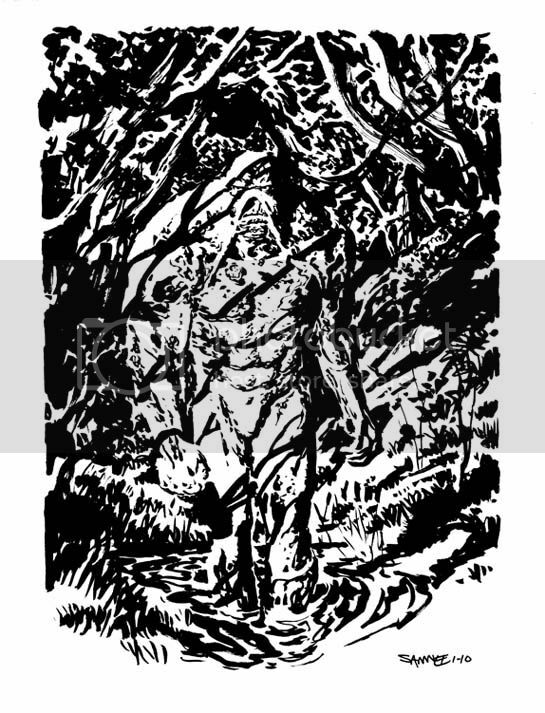 As the proud owner of another killer Samnee Swamp Thing piece, I have to say that I'm still awestruck as to how rich your swampy environs are. The textures are just so thick and palpable, and while the piece that I own has some truly impressive shadow-play at work in it, this one is even more unbelievable. Chris, you just keep getting better and better. Amazing. One of your best. That's really strong, Chris. Wow. wow...just wow. I have only been practicing inks for a couple years and I don't think I'll ever get to that level of aptitude in my lifetime. Hat's off, your stuff is amazing. And the Mighty is my first read in my monthly box. good stuff. wow!.... what kind of pen is that? Dennis - I used a Pentel Color Brush.